It was great meeting a wide range of Edge readers in Washington this week. I also managed to persuade the inimitable Natalie Jaresko to come into Axios HQ in Virginia, where we recorded a podcast. Check it out if you're interested in how she went from the Chicago suburbs to become the finance minister of Ukraine and then the fiscal overseer of Puerto Rico. And for the teachers out there: Charles Schwab is throwing a bunch of money at financial literacy projects on Donors Choose. I wonder what proportion of, say, high school students could understand Axios Edge. "Mr. Trump has selected candidates like Messrs. Moore and Cain in recent weeks because he believes they have the interests of his presidency in mind, the person said. The big picture: Ken Rogoff, one of the most respected technocrats in the economics profession, warned this week that Trump is effectively pushing at an open door. Giving a lecture at the IMF this week under the auspices of the G30, Rogoff warned that the world might be facing "the beginning of the end of central bank independence." None of his four main reasons had anything to do with Trump. 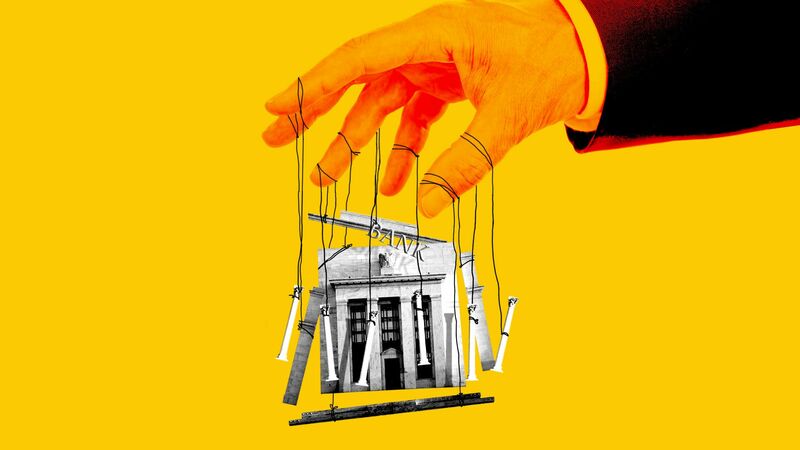 Central banks have become victims of their own success. Historically, the main argument for central banks to be independent has been that without independence, inflation will return. But inflation is below target in nearly every major economy, and long-term inflation expectations have never been lower. No one is worried about inflation anymore, and without that worry, there's little need to keep central banks independent. Central banks also exist to stabilize the broad economy by cutting rates when it looks like we might be heading into a recession. But they can't effectively do that today, since rates are already so close to zero. Central banks have often been needed in a crisis, partly because they're home to a lot of institutional knowledge and expertise. But with rates very close to zero, that knowledge and expertise can just as well reside in the executive branch. In the next crisis, fiscal policy, rather than monetary policy, is going to be the first line of defense. An increasing consensus that national indebtedness can and should be greatly expanded has taken a lot of macroeconomic work away from central bankers and given it instead to finance ministries. Rogoff's proposed solution to all these problems is for central banks to embrace negative interest rates as a policy tool, with a system of subsidies that prevents regular depositors losing money in their checking accounts. "The countries that do it first will be glad they did it," he said. The central banks that don't? They risk losing their independence entirely. The bottom line: Central bank independence is almost never enshrined in a country's constitution; it can be lost easily and needs to be fought for. Politicians now have the wind at their back if they want to take back control of their central banks. But, says Rogoff, "countries that do that, including the U.S., if it chooses to go down that path, will live to regret it." Donald Trump isn't shy about criticizing the Fed, as we saw most recently this morning. 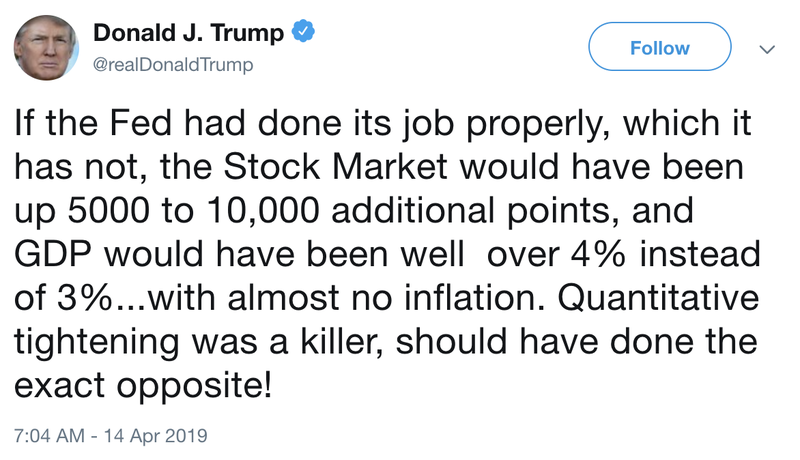 He doesn't like rates as high as they are (which isn't high), and he doesn't like quantitative tightening. Maybe he should have attended Rogoff's lecture. How it works: Rogoff doesn't think that quantitative tightening really counts as monetary policy, nor does he think that the Fed's balance sheet is meaningfully different from the overall fisc: "It is a wholly owned subsidiary of the central government," he says. Quantitative easing involves the government issuing short-term debt and using the proceeds to buy long-term bonds. A finance ministry can do that just as easily as the central bank can — maybe even more easily. A whole department of the Treasury is involved in debt management. If the Treasury let longer bonds roll off while issuing a large amount of short-term bills, that would effectively be QE right there, without the Fed having any involvement. The debt management department has historically been highly technocratic and politically independent. But it's unambiguously part of the executive branch and reports directly to the president. Stephen Moore is still on track to be nominated to one of the Fed's open board seats. He went on CNN this week to say that "a gold standard would certainly be better than what we have right now" and that surging oil prices in mid-2008 were caused by loose monetary policy. Lyft's S-1 was 275 pages long. After digesting all that information, the investors decided to buy: Lyft received $47 billion of orders for just $2.3 billion of shares, and the stock immediately surged to as much as $88.60 per share. It then proceeded to lose a third of that value in the space of two weeks, closing on Friday at $59.90. It's tax day tomorrow, and 70% of the U.S. population is eligible to file their taxes online for free, through the IRS Free File program. In reality, however, you can be forgiven for not knowing about it. If last year is any guide, fewer than 2% of all tax returns will take advantage of this service. It's no surprise that Free File has seen diminishing uptake since it was launched to the general public in 2005. It's not actually operated by the IRS; rather, it's a service provided by for-profit tax preparation providers like TurboTax. Since those corporations want to earn money, they have no incentive to advertise the free option. Were the IRS to offer its own free online tax-filing system, that would certainly be much more popular. But Congress has now barred the agency from ever doing so. The big picture: In countries like Japan and Britain, most taxpayers do not need to fill out any kind of tax return at all. The IRS has enough information on taxpayers' income to be able to implement a similar system here. But Congress won't let it. Medscape has an annual survey of physicians' salaries, and this year, once again, saw them reaching new record highs. The average physician's annual take-home pay is now $313,000. That's 99% of the median U.S. house price. Salaries are a huge part of overall health expenditures, and they are clearly not under control — at least for men. Female primary care physicians have seen their pay go up by $10,000 since 2017, while their male counterparts have received a $29,000 raise. The gap between male and female primary care physicians has widened to $51,000, or 25% — another all-time high. When you buy a Tesla, you're not buying a car, you're buying a computer. A Tesla blog post this week explains that the entry-level $35,000 version of the Model 3 is henceforth going to be physically identical to the Standard Plus version, which costs $39,500. Certain features will just be "software-limited." If you have a Standard car and you want to upgrade to a Standard Plus car, all you need to do is write a check, and Tesla will take its shackles off the software. Standard Plus features not available on the Standard version include heated seats, navigation with live traffic visualization and Tesla Autopilot. There are lots of reasons not to like Hudson Yards, the vast new city-within-a-city on the west side of Manhattan. Among them: $1.2 billion of the funding for the project came from the EB-5 visa program, with even more money on the way. The EB-5 visa was designed to reward foreigners for investing in remote rural areas, or distressed urban ones. Hudson Yards is hardly distressed. So Kriston Capps at CityLab used FOIA requests to find out how EB-5 money ended up being used in one of the richest parts of America. The map above shows a "targeted employment area" where unemployment is more than 150% of the national average. It includes dense housing projects in Harlem, where unemployment is high, as well as commercial areas of midtown Manhattan, where the population is extremely low. Connecting them is Central Park, where the population is zero. 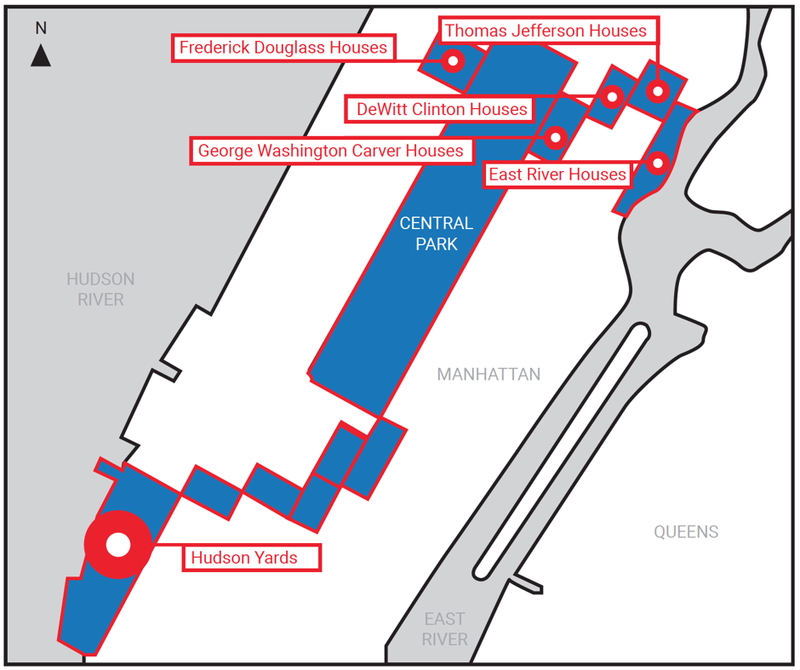 Overall, the unemployment rate in the gerrymandered area is high enough for Hudson Yards to be eligible for EB-5 funding. Only 10,000 EB-5 visas are issued per year. Hudson Yards could easily have used up an entire year's worth of such visas — meaning none left over for investments in genuinely distressed areas. By the numbers: Hudson Yards has received some $6 billion of taxpayer assistance to date, including New York City paying $359 million of bond interest payments when the developer didn't have the money. China will release first quarter GDP on Wednesday. Though the report's accuracy is questioned, it's still closely watched, writes Axios' Courtenay Brown. Economists expect the Chinese economy to have expanded 6.3% on an annual basis, slower than the 6.4% in the prior quarter. Zaha Hadid's Wangjing SOHO development, completed in 2014 in Beijing, is described by the architecture firm as resembling three mountains that "fuse building and landscape to bring together the surrounding community." A Chinese feng shui blogger, by contrast, wrote that "the roads around Wangjing SOHO form a great evil spirit, symbolizing conflicts," and that "all the feng shui taboos can be found at the same time in Wangjing SOHO." The post resulted in a lawsuit, which resulted in the blogger being fined ¥200,0o0 ($30,000) this week. A final word of thanks to Courtenay this week, who pulled the data for the wonderful IRS Free File chart in item #4 above. When it just sits there in the middle of a newsletter it looks incredibly easy. It isn't. The IRS doesn't just publish this data as a downloadable time series, as it should. Many thanks are due to Courtenay, Andrew Witherspoon and thousands of other data journalists in hundreds of other organizations who daily and painstakingly collate this kind of information, making it easy to see and understand.